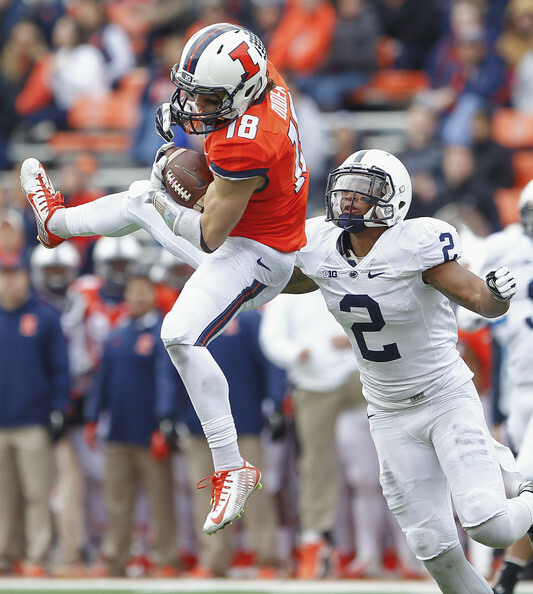 The Illinois Fighting Illini have suffered a major blow to their offense. Top wide receiver Mike Dudek suffered a torn ACL in practice on Wednesday during a non-contact drill. Dudek was the top receiver by far for the Illini. He had 76 catches for 1,038 yards and 6 touchdowns. The next closest receiver was Geronimo Allison with 41 catches for 598 yards and 5 touchdowns. Dudek was named a freshman All-American in 2014 as well as a second team All-Big Ten selection. Dudek will still miss at least half the season, which means the Illini will be without him for Kent State (9/4), Western Illinois (9/12), at North Carolina (9/19), Middle Tennessee State (9/26), Nebraska (10/3), and at Iowa (10/10). Illinois returns their top three receivers after Dudek, including running back Josh Ferguson. Ferguson led the Illini in rushing with 735 yards and 8 touchdowns, but also had 50 catches for 427 yards and 2 touchdowns. The other two receivers are the aforementioned Geronimo Allison and Malik Turner. Turner had 25 catches for 256 yards and 1 touchdown last season.